In its slowest cyclical quarter for iPhone sales, Apple reported earnings of $2.34 per share, riding on a revenue hike of 17% to $53.3 billion. Earnings for the third quarter improved 40%, surpassing analysts’ expectation of $2.18 per share. Revenue also beat Wall Street expectations, which was projected to be around $52.34 billion. iPhone sales for the quarter was 41.3 million units, slightly below the consensus of 41.8 million units. The slowdown was expected as Apple enthusiasts await the next version of the iPhone before upgrading their existing ones. 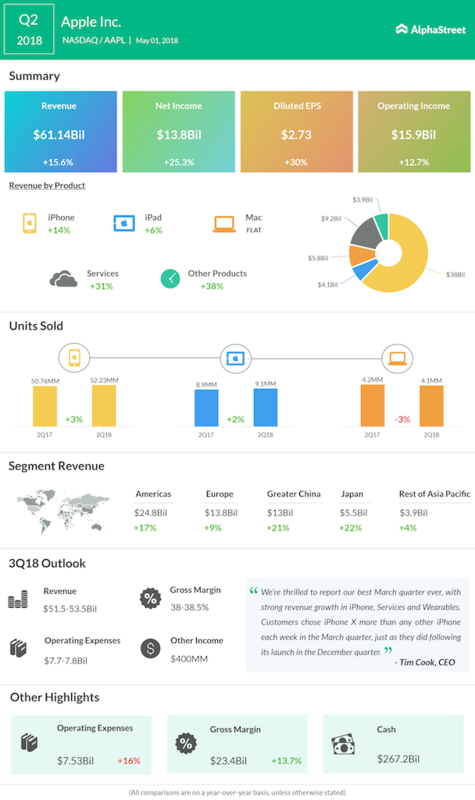 Revenue from both iPad and Mac declined 5% during the quarter, while that from iPhone sales increased 20%. As expected, the average selling price of iPhones jumped to $724, driven by the premium-priced iPhone X models launched last year. Apple’s services business, one of its top growth units, posted a 31% increase in revenue to $9.5 billion. In the prior sequential quarter, the segment, which includes App Store, Apple Music and iCloud, had reported a 31% jump. “Our Q3 results were driven by continued strong sales of iPhone, Services and Wearables, and we are very excited about the products and services in our pipeline,” CEO Tim Cook said. Apple’s revenue from Other Products witnessed a 37% jump in the third quarter to $3.7 billion. 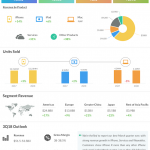 For the fourth quarter of 2018, the company expects revenue between $60 billion and $62 billion and gross margin of 38-38.5%. Meanwhile, the tech giant anticipates operating expenses of $7.95 billion to $8.05 billion during this period. 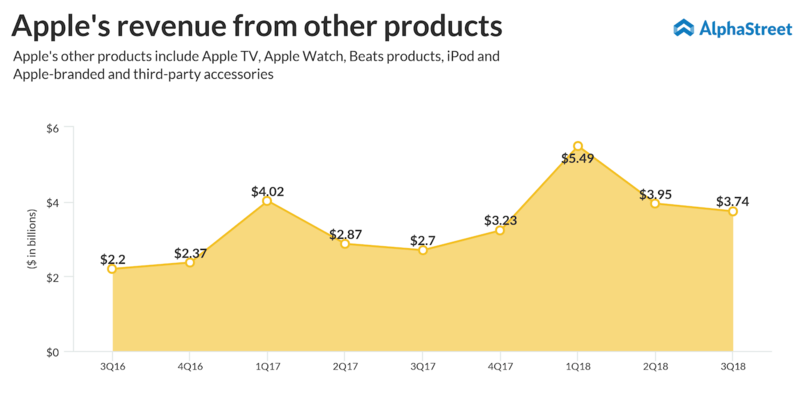 Apple revealed that its revenue from Greater China improved 19% to $9.5 billion during the third quarter, quashing fears that low-priced local players would eat into its market share. Apple shares gained 3% in aftermarket trading. The stock has rallied 28% in the past 52 weeks and 12.3% year to date.